Lt. Gov. Anthony Brown said Monday he was “certainly open” to the idea of independent voters being allowed to vote in Maryland’s party primaries. Lt. Gov. 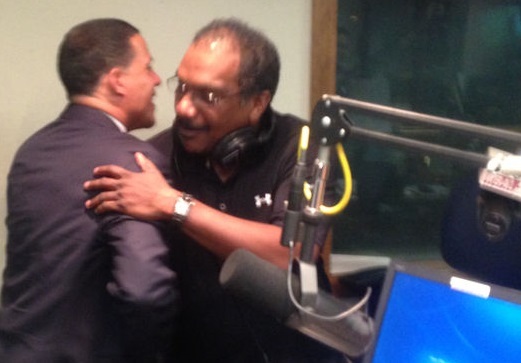 Anthony Brown, left, greets WBAL radio host C4, Clarence Mitchell IV, during an earlier appearance on his talk show. Both photos from WBAL 1090 AM. Brown was responding to questions from WBAL radio talk-show host C4, Clarence Mitchell IV, based on two MarylandReporter.com stories last week. One story explained how the state’s 600,000 independent or unaffiliated voters are “shut out” from voting for candidates in the Democratic or Republican primaries. Brown also responded to a question related to another MarylandReporter.com story that said Attorney General Doug Gansler, one of Brown’s Democratic opponents, was going to file a complaint saying that Brown-Ulman campaign consultants have been illegally coordinating with an independent PAC running attack ads against Gansler. Mitchell wanted to know if Brown became governor in this year’s election, whether he would support allowing unaffiliated voters to vote in the Democratic primary in hopes of increasing voter turnout. Brown and Mitchell, a former Democratic state senator from Baltimore who said he is now registered as “unaffiliated,” were not in favor of allowing Republicans or Democrats to vote in each other’s primaries, as they can in states like Virginia. UPDATED 6/16/2014, 11:30 p.m.In Maryland’s first five days of early primary voting, which began Thursday, 71,159 voters went to the polls, but only 971 or 1.3% were unaffiliated, even though they make up 17% of the registered voters and only 11% of the voters eligible to vote in the nonpartisan primaries for school board. Of those who have already voted, 74.4% (39,280) were Democrats and 24% (12,931) were Republicans; Democrats make up 55% of registered voters in Maryland, and Republicans comprise 25%. Brown’s campaign manager had denied the charges last week. “Our campaign contracts with a lot of consultants … that have many clients,” Brown said. “We don’t control those consultants. “I just think it’s a desperate deception technique, unfortunately by the attorney general,” said Brown. WBAL radio has audio of the full interview by C4 with Brown, which includes comments about his endorsement by the Sun and Maryland’s lack of economic growth last year. The questions about unaffiliated voters occur at 6:22 in that audio and at 10:40 related to campaign finance violations.